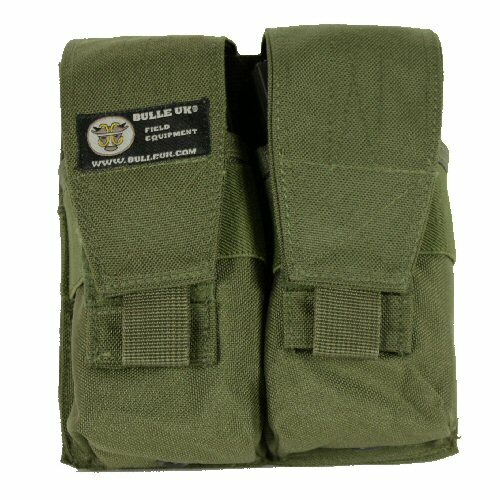 The Bulle US MOLLE adjustable double mag pouch is a rifle magazine pouch with adjustable top flap. 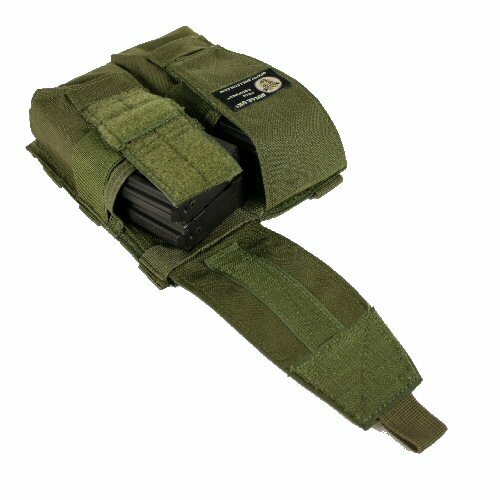 This adds versatility to the pouch, allowing it to hold G3, G36, AK47 and M4 magazines easily. 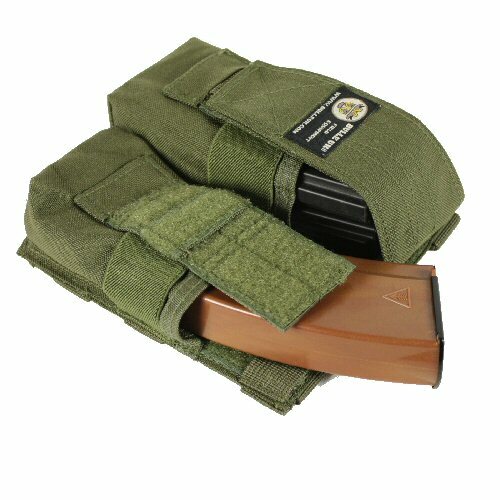 The pouch will hold one G3, G36 or AK47magazine in each pocket, or it will also hold two M4 magazines in each pocket. 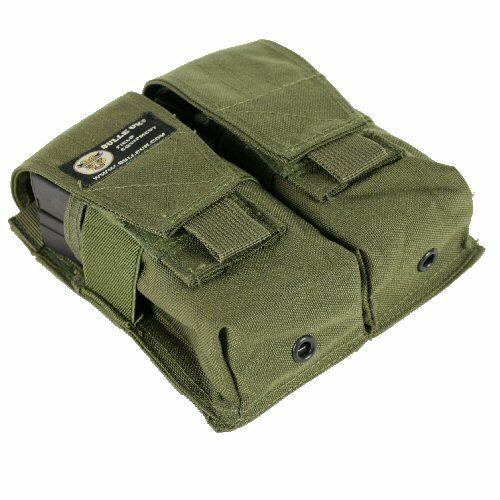 The edges of the pouch are trimmed down as much as possible so as not to take up extra space on the MOLLE base, and to allow close fitting side by side with other types of magazine pouches or another adjustable high speed double mag pouch. Use of heavyweight webbing materials is cut down as much as possible, and the body and flap of the pouch are made of 1000D military specification Cordura nylon which is internally PU coated for waterproofing and stability. The pouch has wide 40mm elastic around each pocket to help retain contents and reduce rattling between magazine casings. Additionally, the pouch flap is designed for quick operation with a layered velcro closing and narrowed flap velcro. This helps to reduce noise and increase pace for withdrawing the contents of the pouch, particularly in high stress situations. Price is for one pouch only. Accessories shown with pouch are for illustration purposes only and do not come with the pouch. 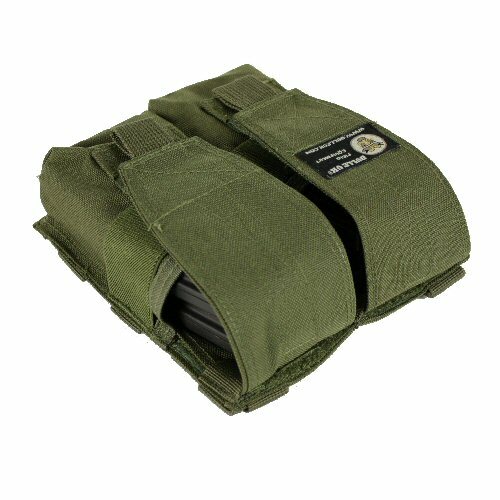 Search terms: MOLLE pouch, double magazine pouch, M4 pouch, ammo pouch.